a game against New Mexico State in 2012. 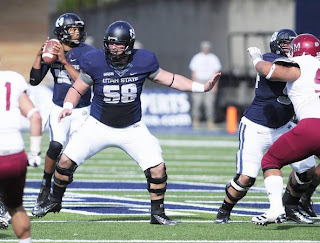 LOGAN — Heading into his fifth season at Utah State, Tyler Larsen has seen it all. Larsen was there for the first year of the Gary Andersen era when the outlook for Utah State football looked bleak. 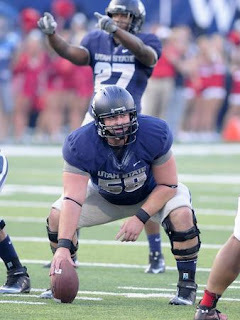 of the 2010 season and has been one of the many reasons USU football has had its fortunes turn for the better. His excellent play did not go unnoticed. Larsen was voted by the coaches to the All-WAC First Team in 2011 and 2012 for his work in calling protection assignments and opening up gaping holes for one of the nation’s best rushing attacks. the ball during a game against Utah in 2012. The awards don’t stop there. Going into the 2013 season, Larsen has already been shortlisted for the Dave Remington Award, given to the nation’s most outstanding center, for the third consecutive year. In addition, he was the only USU representative on the first team of Phil Steele’s Preseason All-Mountain West Conference squads. With a list of accolades that seemingly grows by the week, it would be easy for Larsen to take the summer off and rest on his laurels for a bit, but he has no plans to do so. Every award has only added more fuel to the fire, according to Wells. Larsen has the mentality of improving himself. He works out with his offensive line teammates in Logan nearly every day, allowing for just one off day for rest. Following workouts, the offensive line will often run through drills to keep off the rust and prepare for fall camp. In his spare time, Larsen finds a few minutes to watch film of old games, looking for technique flaws that can be improved upon before his senior year officially begins. It’s that work ethic and leadership that Wells is counting on from Larsen this summer and fall. As a senior leader, Larsen will be one of the players leading the charge during player run practices and offseason workouts. When the season rolls around, it will be the experience of Larsen and quarterback Chuckie Keeton that will be the motor for Wells’ high-octane hurry-up offense. All five starters return to the offensive line for USU, a rare luxury in the college football world. With an experienced group in the trenches that already has a feel for each other and proven success, Wells can use his hurry-up offense a little more — something that Larsen and the rest of the O-line enjoy. In three seasons at center, Larsen has opened holes for three NFL running backs. With a good fourth season, Larsen will be on track to join Robert Turbin, Michael Smith and Kerwynn Williams in the pros. Scouts have Larsen tagged as one of the top draft eligible centers in the NCAA. The dream of playing professional football could become a distraction for someone preparing for his final season, but Larsen has an ace up his sleeve. Shortly after the 2013 draft, Tyler’s brother, Cody Larsen, a three-time All-Conference selection at defensive tackle at Southern Utah, signed an undrafted free agent contract with the Baltimore Ravens. The two talk on the phone often, with Cody dispensing nuggets of what to expect in the professional game, giving Tyler extra confidence that his play for the Aggies will push him to the next level. “He just says I need to take it one day at a time and I’ll be there soon,” Tyler Larsen said.